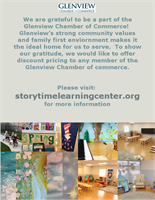 It is with great pleasure that Storytime Learning Center has joined the Glenview Chamber of Commerce! We look forward to strengthening our relationships with the families of Glenview. As a token of our appreciation, we would like to extend promotional pricing to all! Storytime Learning Center is a day care center offering full-time and part-time care for children of toddler, preschool, and kindergarten age. Storytime Learning Center was created out of love and respect for children. Our center is warm, nurturing and inviting. We provide a natural and creative environment to foster healthy growth and development for children. We experience a rhythm of the day, encourage meaningful work, and imaginative play. We believe that children learn best through imitation and play. Our name Storytime Learning Center comes from our favorite tradition of sharing classic stories passed down from generation through generation. Our working hours are Monday through Friday from 7:00AM to 6:00PM. Please call (847) 730-3534 to schedule your tour today!